Would you consider San Diego to be Southwest? We are just about as far south and west as you can get. I actually think I must have been destined to live here because I have always been drawn to “southwestern” things, especially food. If I’m at a cook out and there is a choice between a regular pasta salad and a southwestern one, you can pretty much guarantee that I’ll go with the latter. So when my aunt sent me an email with a recipe titled Southwest Marinated Pork Tenderloin I immediately knew that I would be making it, soon. I’m ashamed to say that I don’t always use a grocery list when I do my shopping. Even when I do meal plans I mostly shop from memory. Not surprisingly I almost always make at least one extra trip to the store during the week to pick up an ingredient that I forgot to buy. It’s something I’m trying to work on. This time, I carefully wrote out my list and even checked the weekly ads for sales. And you know what, I still forgot something! I some how forgot the main ingredient, the pork tenderloin. Not wanting to give up on making this I decided to use chicken since I always have that. It turned out great! I still plan to make this marinade with pork, but the chicken was not at all disappointing. 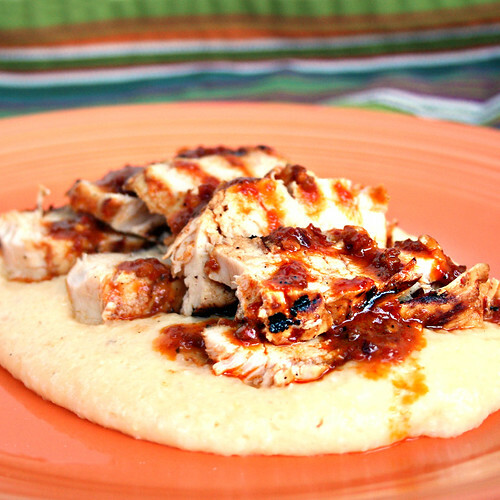 I served the sliced grilled chicken over cheesy grits and the combination was near perfect. The chicken had a little heat and a nice smoky flavor that was complimented by the creamy cheesy grits. I can’t wait to make this again! In a measuring cup or small bowl, measure out the orange juice and olive oil then stir in the salt and pepper and set aside. In the bowl of a food processor, puree together the chipotles and 2 cloves of garlic for 15 seconds. Scrape down the sides of the bowl if necessary. With the food processor running, gently stream in the juice/oil mixture. Place the chicken (or pork) in a *shallow dish and pour the marinade over top. Cover and refrigerate for 2-4 hours. Flipping the chicken over occasionally to evenly coat both sides. Remove from the fridge 30 minutes prior to grilling. Grill directly over **medium heat for 4-5 minutes per side (6-7 for pork) or until the juices run clear. If using pork, the inside will still be slightly pink. Remove from grill, cover with foil and let rest for 5 minutes before slicing. While the meat is resting pour the remaining marinade and chicken broth into a saucepan over medium-high heat. Bring to a rolling boil for 2 minutes. Reduce heat to medium-low and let simmer until reduced by half. Spoon the sauce over the sliced meat and serve. **Unfortunately we do not have a real grill right now, so I used my cast iron grill pan. I set the burner to medium-high heat and I used a large lid (from one of my pots) to set over the chicken to help cook it evenly and a little faster.